The MARK2 hybrid tent-hammock prepares you for anything whether hanging or going to ground. Now get the best spectra suspension system included in the box. You won’t believe how roomy and versatile this hammock is. This breathable cover zips over the mosquito netting (it is standard on 4-season models). The water repellant WeatherShield provides warmth, privacy, and extra protection from moisture that could blow under the tarp. The MARK2 bivy hammock is a hybrid tent hammock prepares you for anything. Only the Clark MARK2 gives you exceptional comfort both on the ground and in the air. Interior storage pockets and connections for your backpack make the MARK2 the perfect hammock for trips when trees may not be in abundance. The Timp-Hitch suspension system is included with spectra-style slings and tree straps all included in the box. The patented pole design makes the MARK2 the only hammock on the market that is both stable and able to provide a roomy ground shelter. The sturdy, sealed bed is meant to go directly on the ground, creating a bathtub effect to keep water out. The MARK2 bivy hammock is ready for rain, and includes a quality rain fly that snaps around the tent for great protection. The best No-See-Um netting zips off when you prefer an open hammock. The flexible poles allow you to enjoy a spacious, stable hammock bed that won’t tip like hammocks with static poles will. 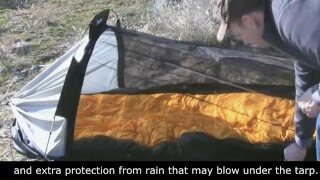 This bivy hammock includes waterproof rain fly and ground stakes. How do I winterize the MARK2? The MARK2 can be winterized when you order it with the WeatherShield feature and use a pad for insulation. The WeatherShield is a breathable, water repellent layer that zips directly over the netting. Its main purpose is to provide warmth, but it will also drain away moisture that blows under the rain fly. The included rain fly is sil-nylon and waterproof. 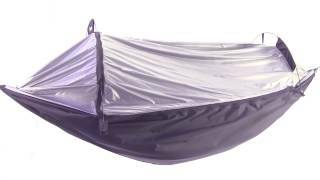 It clips around the hammock and protects from rain and wind while providing venting between the rain fly and WeatherShield to prevent condensation. The bed is sealed and provides a bathtub-like effect when on the ground. Together, the WeatherShield and rain fly provide great protection against winter cold and the elements and you will stay warm if you have a good pad inside and a sleeping bag made for the temperatures you anticipate. I got my Mark 2 for Christmas and since then I have used it about five times, I love it and I think it is the best sleeping system ever. My reasoning is the dual nature of it, one time when we went camping and the trees were all dead, but with the mark i could sleep on the ground, instead if i brought one of my other hammocks and would had have to sleep on the ground in rain. It is also one of the comfiest hammocks I have ever been in, and i have slept in a lot of hammocks. Overall great product. I recommend it. Used it a few times already, and it performs great. Still waiting for a rainstorm so I can give it a real trial. I got the optional weather shield, which seems silly to be without. I got a great nights’ sleep each time I’ve gone out with it. Clark is the best! Cheers! I like the Mark jungle hammock for its versatility. I have used it on my motorcycle trips and plan to use it on my trip to Alaska. Also, my wife used it on a camping trip last summer. She said it was incredibly comfortable and she slept great! These are highly efficient, go anywhere, backpacking sleepers. I have used this setup for weeks at a time very near Nowhere. I used this hammock on my ‘16 thru hike of the the Appalachian Trail. I absolutely love it. The versatility is what made the MARK2 so special for me. I slept off the rocks in Pennsylvania, but on the ground when there were no trees around to hang from. I did make some modifications to the suspension along the way for the sake of weight/volume. First, I replaced the nylon ropes and drip rings with homemade DynaGlide Whoopie Slings slings and Some tree straps I found at an outfitter along the way. I also had to glue a pole clip that came apart. Despite all of the updates I made, I still believe this is a wonderful piece of gear, and the only thing like it I saw along the way. Thanks guys and gals at Clark.